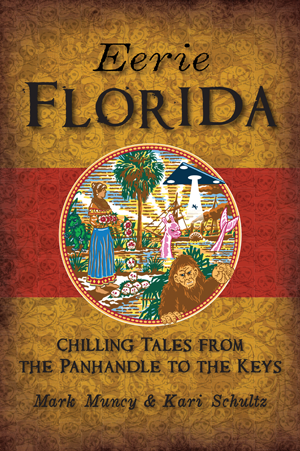 Most know Florida as the land of endless sunny beaches, but the state is home to numerous eerie legends and mysterious creatures. The Everglades is home to the elusive Skunk Ape, a strange bipedal creature recognized by its odor. An uncanny doll reputed to have a life of its own greets visitors in a Florida Keys museum. An ancient monster is reported to roam the rivers in the northeast corners of the state, and in South Florida, a man built "America's Stonehenge" via mysterious means. Join Mark Muncy and Kari Schultz as they uncover the history behind the state's creepiest stories and unusual locations. Mark Muncy is the creator of Hellview Cemetery, a charity haunted house in central Florida that was so infamous it was banned by the City of St. Petersburg. An author of horror and science fiction, he has spent over three decades collecting ghostly tales and reports of legendary beasts. This is his first work for The History Press. He lives in St. Petersburg, Florida, on the remains of an ancient midden with his fiancée, Kari Schultz. Occasionally, he is visited by his daughters when they remember he is still there. Kari Schultz is a varied illustrator at Fox Dream Studio who enjoys fantasy and horror. She has been working on art as long as she can remember and reading folklore and horror almost as long. She has a short comic featured in Uncanny Adventures: Duo #2 from 8th Wonder Press. This is also her first work for The History Press. She has a thing for foxes. She is being held captive in St Petersburg, Florida, with a small party of fish, snails and plants until she can get more work published. She appreciates good cheese if you have any to spare.